We are excited to announce a new pet food line on our shelves, from the makers of Zignature and Fussie Cat—Essence: The Embodiment of Superior Pet Nutrition. At End of the Leash, we carry both the Essence canned and dry for dogs and cats. Protein is important to carnivores. It’s what builds strong muscles and fuels their energy. We are committed to a meat first philosophy for the best possible health for your dogs and cats. It is our personal vision for premium pet food. Made with the highest quality ingredients and loaded with animal proteins, Essence® brings your canine and feline companions closer to nature. Animal proteins provide the building blocks of powerful muscles, strong bones, and healthy functions. Formulated from the very Essence® of nature, this is the next generation of pet food. The highest quality proteins from responsible and clean sources. That is the Essence promise. Our proteins are sourced from all over the world, bringing together ingredients that are specific from certain regions and using them to craft our unique recipes. Each recipe showcases the best of poultry, fish, and red meat. We choose the proteins that provide the healthiest nutrients and great taste for all your furry companions. We use ingredients like Guinea Fowl, Turkey, Herring, Salmon, Boar, Lamb, and many more. Dogs descended from a now-extinct prehistoric wolf. The modern gray wolf is the closest living cousin of the modern dog, having branched off from that common ancestor only 40,000 years ago. In fact the modern dog and the modern wolf share 99.96% of DNA. Our dogs are basically just super-social, people-friendly wolves. That also means dogs share nutritional needs with their wolf cousins as well. Cats are of the family Felidae. This family includes all the big cats we are familiar with, such as lions, cougars, and tigers. Within that family is a group of smaller cats called Felis. It is from this group where the modern domesticated cat comes from. Cats still have the natural hunt instinct and dietary needs of wild cat species. Those wild cats were hunters and carnivores, and modern cats are no different. So dogs and cats are essentially wild. In recognition of this, we created Essence to bridge the past with the present, and to provide for our cats and dogs a nutrition that’s closer to nature, the way nutrition was meant to be. biologically adapted to catch prey and eat meat. These animals do not farm or graze. The plant food that they do consume come from the stomach contents of the prey they catch, often which are herbivores. Essence recreates that diet. Our approach is always animal protein first. The way it was meant to be in nature. Canines and felines are designed to eat meat. We leave out grains and potatoes and any other ingredient that does not serve a natural, clean diet philosophy. Elimination diets are a way to assist your pets avoid potential food sensitivities. Foods that combine such ingredients, e.g. starches, oils, and vegetables, can have an effect on dogs and cats, such as irritable stomach and other conditions. Essence cuts out ingredients that might cause food sensitivities so that instances of an undesired effect is minimized. 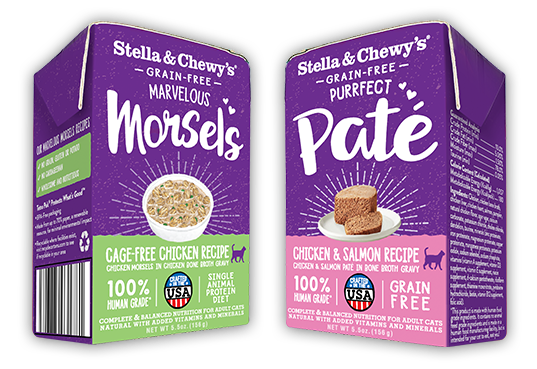 Also new on our shelves…FOR CATS…are Marvelous Morsels and Purrfect Pate by Stella & Chewy’s! If you are looking for a limited-ingredient, single-source protein food for your kitty, this is a superb option. Packed in Tetra Paks, they are BPA-free, recyclable in many areas and biodegradable. Real meat chunks, nutritious bone broth, and organic vegetables are what you’ll find in this food. What you won’t find—carrageenan, grains, gluten, or potatoes, and no ingredients from China. These new foods are also a great way to get more hydration into your kitty—they are 78-82% moisture (bone broth, not water). You can use Marvelous Morsels and Purrfect Pate as a complete meal for your adult or senior cat, or as nourishing toppers (not recommended for kittens). Stop in store and grab some for your best feline friend! Spike is a five year-old Red Ear Slider. He is an aquatic turtle who enjoys most of his time swimming and floating about. Because he is a reptile, he does hop out of the drink from time to time to soak up the "rays" and "sun" himself. When the weather is warm enough he would even enjoy going outside for supervised shenanigans. The average life span for a turtle like Spike is 20-30 years; so he is a long-term companion. However, Spike is most likely a loner and will not need to have turtle friends to be fulfilled. Stop in to HAWS and learn more about him!